Trailhead and parking area are on Base Station Road in Chandler's Purchase, NH (summit is in Sargent's Purchase). Base Station Road (sign for the Cog Railway) leaves Rt. 302 4.4 miles east of Rt. 3. The large parking area is on the right, 5.5 miles up the road. Almost everyone has heard of Mt. Washington. Thousands of tourists visit the summit daily via its Cog Railway and auto road. Hikers can choose among almost limitless routes to the summit on its vast network of hiking trails. The tallest summit in the northeast and the most prominent one east of the Mississippi River, Mt. Washington is easily recognized from anywhere it is visible. Since the 1800s, over 150 people have died on Mt. Washington, mostly due to its unpredictable weather. The convergence of three storm tracks on its summit give Mt. Washington, as the signs on the hiking trails say, "the worst weather in America". Despite these frightening facts, a hike on Mt. Washington can be one of the most scenic and enjoyable trips in the White Mountains. The most popular trail, Tuckerman Ravine Trail, ascends the mountain from Pinkham Notch, but the most scenic trail, Ammonoosuc Ravine trail, which climbs from the Crawford Notch area, is described here. With waterfalls, alpine lakes, and endless views, this trip to Mt. Washington is unforgettable. Leave the far left side of the parking area and head out at easy grades on the pretty, fern-lined Ammonoosuc Ravine Trail. In 0.3 miles, the trail bends to the left and drops to cross Franklin Brook. It then swings back to the right as it continues its easy meander through the lush forest. After 0.7 miles more, the trail passes a path to the Cog Railway Base Station as it approaches the Ammonoosuc River. You are greeted by the rush of foamy white cascades. Continuing on, the trail runs close the river for most of its length. There are many places to step out to the river and enjoy its remote feel. Soon, the trail passes a plaque honoring one of the many deaths which have occurred on Mt. Washington. As you venture further along the river, look up at the hillside to glimpse the cascades which lie in the ravine ahead. Climbing soon becomes rougher, and after passing an open area in the river, the trail heads to the left to cross Monroe Brook at 1.7 miles from the parking area. In another 0.3 miles, the trail crosses a log bridge over a precarious drop into the river and soon reaches the Gem Pool. There is a good view of the Gem Pool's cascade from here, but you may have to move around to be at a good angle to see its green color. After crossing the river (at the outlet of the pool), the trail begins a very steep and rocky climb. Continue climbing on the relentlessly steep trail for 0.2 more miles, then turn right onto an obvious side path, which descends to a rock ledge high above another green pool in the river. Two enormous waterfalls, separated by a rock wall which blooms with rhodora in the spring, plunge down narrow chutes and join forces in the pool below. The south waterfall is the more impressive of the two, as it is the one on the main branch of the river. This waterfall splits up on its way down and forms numerous fanning drops. The one on the north side, while smaller, is also very impressive. It flows down at an angle along the rock wall dividing the two. From this side path, the trail continues climbing steeply. After climbing the height of the waterfalls, it passes a smaller cascade and soon crosses the brook. After a small wooden ladder, the trail emerges on open ledges along the river, now a small mountain stream. The first views appear to the Cherry-Dartmouth Range and across the Ammonoosuc Ravine to the ridge of the Cog Railway. The trail now climbs moderately along the ledgy banks of the river. After crossing two branches of the river, it climbs briefly through the forest before returning to the water at a beautiful area of cascades. The trail then continues along the river, in and out of the forest, before crossing it again below a cascade. A long stone staircase leads upward and the trail soon steepens on open ledges beside the river, now a tiny brook. Soon, it emerges in the alpine zone, where views up to Mt. Washington improve. The trail ends at AMC's Lake of the Clouds Hut near the top of the ridge, at 3.1 miles from the parking area. From here, take a short detour to Mt. Monroe on the Crawford Path (required for 4000-footer climbers; included in hike statistics). Turn right onto Crawford Path and ascend to the ridge top. Turn right onto Mt. Monroe Loop and begin climbing up the steep northern face of Monroe, heading toward a false summit. As the trail approaches the summit cone, it steepens and switchbacks several times over rock scrambles. Picturesque views of Mt. Washington over Lakes of the Clouds open. After clearing the false summit, the trail heads slightly downhill over the ridge, with the summit in view. A quick climb brings you to the sharp summit, where there are amazing views, especially into the Presidential Range-Dry River Wilderness, something not seen nearly as well from Mt. Washington. This is 0.4 miles from the hut. Across the huge bowl of Oakes Gulf is Boott Spur, below which split the Montalban and Rocky Branch Ridges, which extend through the wilderness. Above the shoulder of Boott Spur lie the mountains around Conway, including Mt. Kearsarge North and Doublehead Mountain, with distant horizons in Maine beyond. Further to the right is the Moat Range. To the right of the Moats lies Mt. Chocoura and the Ossipee Range. Above the winding valley of the Dry River is the distant Sandwich Range, with the Nancy Range below. The great unnamed mountain range of Mts. Carrigain and Hancock is prominent further over. In the foreground, the curving alpine ridgeline of the Southern Presidentials extends away from you down toward Crawford Notch. Across the notch is the Willey Range, with the Twin Range beyond. The Franconia Ridge peeks over the Twin Range. Further to the right are the minor Little River and Rosebrook Ranges. Above the Bretton Woods Valley, the view extends into the distance, far into Vermont. Off to the northwest, the view remains the same as it was ascending the Ammonoosuc Ravine Trail. To continue to Mt. Washington, return to the Lakes of the Clouds Hut and continue on the Crawford Path, passing by the Ammonoosuc Ravine Trail. Walk by the front door of the Hut, then pass Dry River Trail. The trail then passes near the beautiful lower Lake of the Clouds, where a side path leads to the shore for picturesque views over the water. The main trail crosses its outlet, the headwaters of the Ammonoosuc River, then leads to the upper lake, just as scenic. It then ascends under a ledge to a trail junction with Camel Trail and Tuckerman Crossover. The trail now ascends moderately along the side of the ridge, soon reaching the elevation level where the trail surface becomes boulders. A long, tiring climb begins, with views back to Mt. Monroe and Lakes of the Clouds opening up. Cairns topped with white rocks now mark the trail. Pass Davis Path 0.7 miles from the last junction, then pass Westside Trail. The trail grade eventually lessens and the summit buildings come into view. After passing Gulfside Trail and the last of the alpine grass, the trail makes its final climb to the summit area, where it joins a gravel path. Rocks to the right of this area make the best place to enjoy the southern view. Continue up past various communications towers and other buildings to the main gravel lot in the center of Mt. Washington State Park. Walk past the Tip-top House, a historical hotel first built in 1853 (read about it on the state park's web page), then follow a path on the left up to the summit. Ahead is the Sherman Adams Building, where an observation deck provides the best place to view the Northern Presidentials and the Carter Range. Inside, you will find a post office, cafeteria, gift shops, and an interactive weather museum. Descend from the summit on Trinity Heights Connecter (signs for Gulfside Trail and the Appalachian Trail), located near the summit sign, opposite the side you came up. Head down over the rocks for 0.2 miles and join the Gulfside Trail (bear right), with great views of the Northern Presidentials in front of you. The path becomes gentler as it leaves the rocky cone of Washington. Follow it downhill across the grass and rocks, soon crossing the tracks of the Cog Railway. Just beyond, turn left to stay on Gulfside Trail. The trail now runs along the brink of the Great Gulf, with spectacular views over 1500 feet straight down to the floor of the gulf. The monstrous cliffs of Mt. Clay loom ahead as you walk down the trail. A rocky outcrop on the right provides a particularly stunning view down to Spaulding Lake. The trail continues a gradual descent over the rocks parallel to the cog railway tracks, reaching the other end of Westside Trail half a mile from the last junction; just beyond, Mt. Clay loop goes to the right. Continue along Gulfside Trail as it heads across the slope on the west side of Mt. Clay, ascending gradually. The summit ridge of Clay is visible above. In 0.3 miles, turn left onto Jewell Trail. This trail descends easily at first, then more steeply, but over much better footing. The long ridge on which the trail descends is seen downhill. 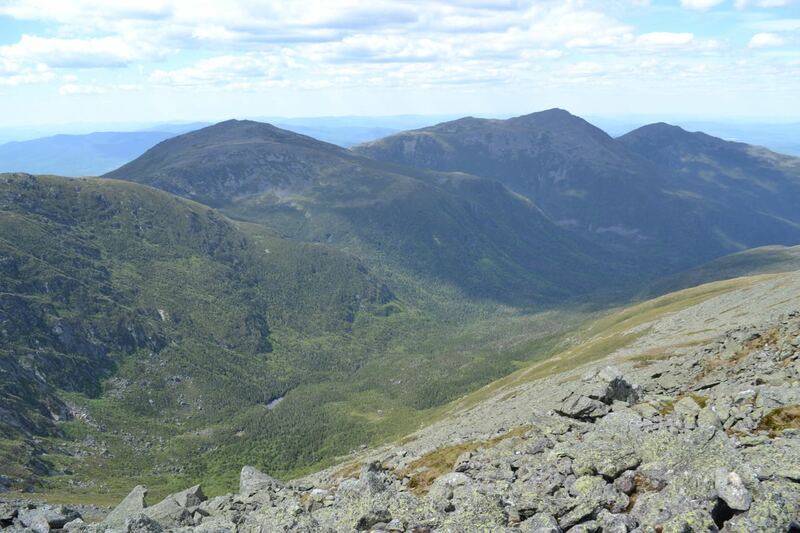 Views across Burt Ravine to the Southern Presidentials open as you go further down. The trail eventually reaches krummholz, and at 0.7 miles from the Gulfside Trail, enters the forest. Now, a long moderate descent remains. The trail remains fairly rocky near the top, but smooths out lower down. About a mile from treeline, the trail passes through a blowdown patch where you see the last views of the hike, looking up to the Southern Presidentials. After a slightly easier descent for another mile, the trail crosses a bridge over Clay Brook. It climbs the bank on the other side, then passes a connecting path to the Cog Railway Base Station. The trail descends gradually and in 0.6 miles, passes Boundary Line Trail. After another 0.4 miles of easy walking, the trail crosses a bridge over the Ammonoosuc River and ends at Base Station Road, directly across from the parking area.